Apologising is a very British past-time. Someone bumps into you on the street and you apologies. It’s like a reflex. The Sorry reflex. I remember the best apology I ever received. It was from a client at work. I had stepped in to facilitate the group in the absence of the regular facilitators and she, being angry (about what I can’t remember) had proceeded to lie down on a sofa with her back to the group. No way was she going to participate! After the group she approached the staff office to apologise. She wasn’t being made to apologise but my goodness did she mean it. She started with ‘I’m sorry’ but then followed up with ‘for my behaviour in the group’. 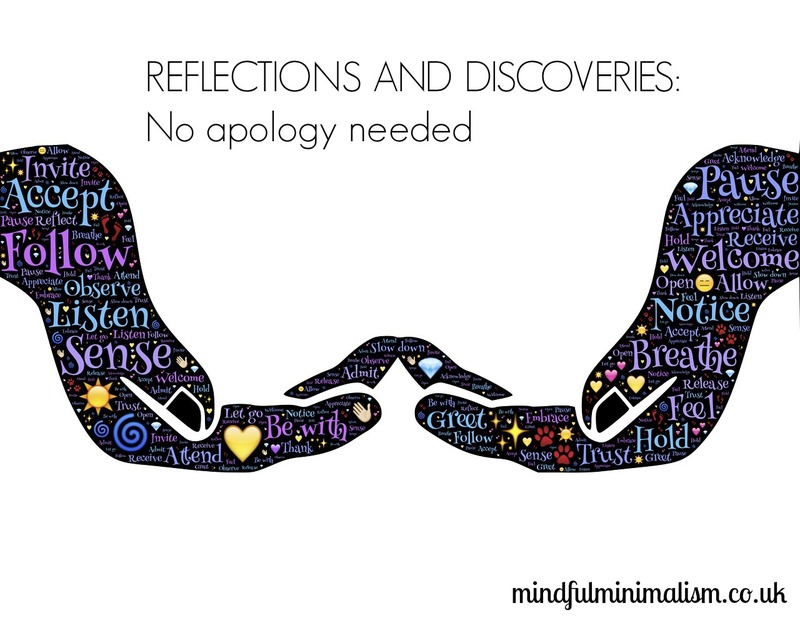 Being specific about what you are apologising for is a great way to reduce overly apologetic behaviour. If you don’t know what you’re apologising for do you actually need to be apologising? The client then explained her reflection on what impact her behaviour might have had on me and the potential consequences for the future e.g. I might be less inclined to step in and facilitate such a group again. It was an amazing apology as she had clearly articulated what she was sorry for and considered the impact of this both in the long and short term. I felt like she had really empathised with my position. What might you ask has this got to do with Mindful Minimalism? 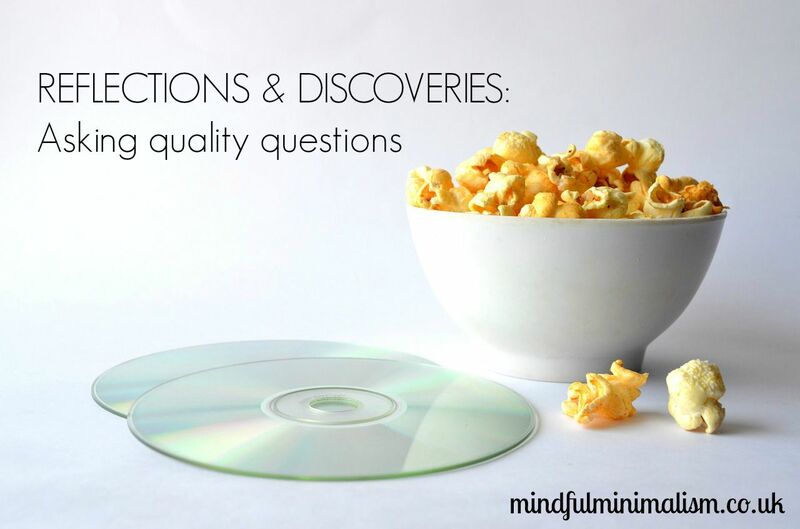 I’ve been thinking about my recent foray into discarding yet more DVDs and realised that much of my movement came from my combined use of mindfulness skills of non-judgemental stance and acceptance. Historically, albeit unintentionally, I had been holding on to films for other people. To support my fantasy self who had eclectic taste in films AND needed to communicate this to others. By being able to accept my go-to films are specific fantasy/superhero, romantic comedy and teen musical dramas I’ve been able to let many more go. I really enjoy watching an eclectic range of films but I no longer need to let other people “see” that. No apology is needed for my go-to movies or for being current reality me! Minimalism is about accepting who you are. Too often our possessions provide us with a wanted distraction. We might be too uncomfortable to sit with ourselves so the distraction is welcome. As we begin to remove the clutter and distraction we are left with the space to explore and perhaps accept those aspects of ourselves that we have spent years running from; too caught up in impressing others to realise how impressive we are. I came across 5 Productivity rules you should know in your 20s by Michael Gregory. While usually I’m quite cynical about these types of posts, actually I enjoyed this one. Perhaps it was because both mindfulness and decluttering make an appearance, but lets face it we all have biases. Know how to read at least once a day. Know how to uni-task instead of multitasking. Know how to eat that frog! I’m not in my 20s but I’m sure you’ll agree his advice is ageless. Have you ever visited someone’s home for the first time and taken a gander at their collection of music, films or books. It’s usually accompanied by judging and comparison. Do they like the same things we do? What does there collection say about them? It’s a type of values foreplay that I’m sure most people, myself included, have engaged in. 5 years ago when my wife and I met she was astounded by the number of DVDs I had. I did not have a TV but I had DVDs. LOTS of DVDs. She ‘modernised’ me, introducing a TV, kettle and microwave into my home but the DVDs remained. Over the last year I have whittled my collection down to a mere 280. Some of them are hers and I wouldn’t choose to keep them, but to be honest most of them are mine. I’ve been through them twice already – a quick first pass and then using the Marie Kondo method of taking them all off and asking “Does this spark joy?” before replacing any that do. I was surprised therefore that joining Netflix triggered the immediate thought – well I can get rid of Heroes and 24. Netflix apparently is providing me with some form of psychological safety net. However not one to pass up the opportunity for self reflection and removing things I tackled the DVDs again. I recently came across a quote: “The quality of your life is determined by the quality of questions you ask yourself and others. What are you asking?” My research suggests this is based on a quote by Tony Robbins, however the idea has been a sticky one. What if the quality of my decluttering is based on the questions I’m asking myself? When deciding to remove possessions we all ask ourselves questions. Does this spark joy? Do I believe this to be beautiful or know it to be useful? Would I buy it now? Am I holding on to it because of an association? Am I holding on to it because it represents an investment? Is my fantasy future-self desperately trying to hold on to it? Why am I holding on to it? Would I prefer the money/space? If I let it go and regret it, is it easily replaceable? What I became aware of was actually asking one question was too simplistic an approach. Would I buy this now? Well no because I’m not generally buying anything. Do I believe it to be beautiful or know it to be useful? It’s a DVD it doesn’t fall into the beautiful category and the usefulness is based on a scarcity and instant gratification mentality. Does it spark joy? Some of them were easy and brought an automatic smile to my face. Others however did not immediately spark that smile but I was uncertain about letting go. There were a fair few that ended up in an ‘I’ll watch once more and then get rid of’ pile. The following day this pile simply moved to the get rid of pile. Specific Trilogy/series (X men,Lord or the Rings, Harry Potter, Sharpe etc). But having enjoyed a film does not mean I’ll necessarily watch it again. I don’t have to keep it to remember the film. That’s just not going to happen: I enjoyed Ghandi a few years ago but have no idea what happened. So why was I holding on to the others? Nostalgic value…Goldfinger was the first Bond film I watched on terrestrial TV when I was a child however I’m far more lilkely to reach for Casino Royale given the choice. Life stage specific e.g. Human Traffic, Monty Python and Battle Royale. Films said something about me. What I wasn’t always sure perhaps they were merely supporting my ‘eclectic’ tastes e.g. The Princess Bride & Life of David Gale. Films I “should” have in my collection: Pulp fiction, Flashdance, & American Beauty all fit this description. Excess of the films I like. Some films were simply not high enough calibre. They fit in the categories listed above, however there were others in my collection that were my “go to” movies. Films and shows my fantasy future-self was going to get round to watching e.g. Spirited Away & City of God. This time 200 DVDs survived the cull. That brings the total number of DVDs I’ve removed to 130. It’s not even half way and there are a few that I’m erring about but for now it’s good enough. 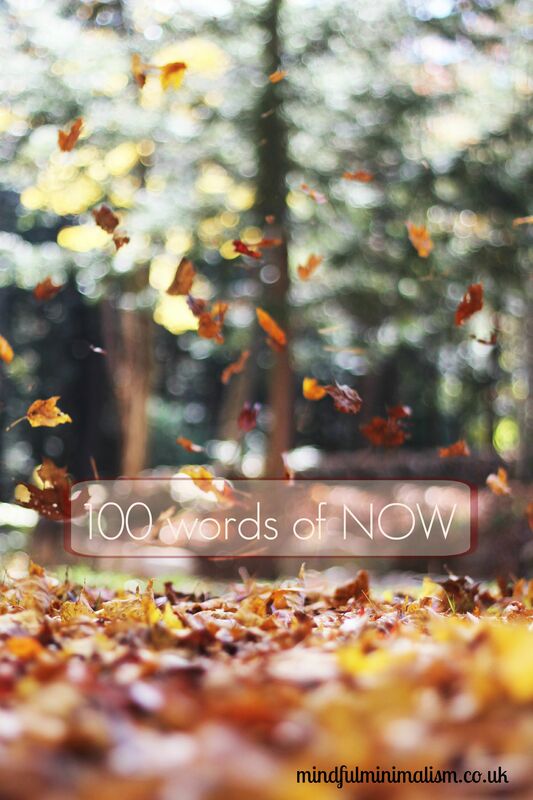 Once upon a time, Leo from Zen Habits had another blog mnmlist. One of is last posts was entitled The Dangers of Reading. It was a thoughtful reflection on how reading can activate our fantasy future self (although that is not what he called it). Inspiration can lead to distraction and this lack of focus can keep us from doing anything well. His answer is not to stop reading, but to be more mindful of our impulses when we do. 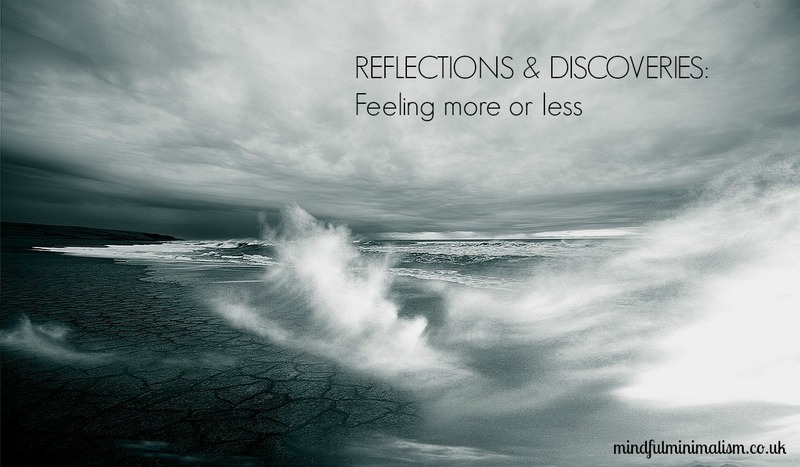 This weeks post is motivated by a comment on last weeks Reflections and Discoveries: Is it fit for purpose? 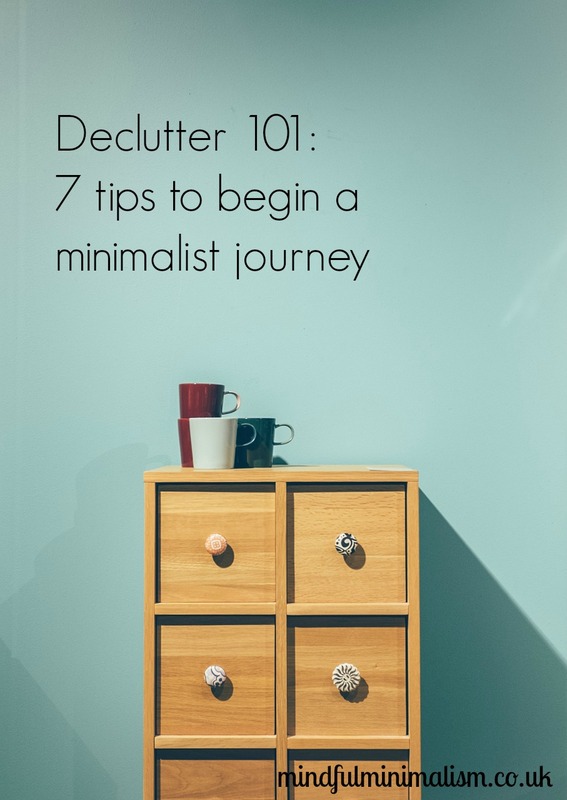 and gives 7 top tips to begin a minimalist journey. If anyone ever asks me how I came to be a minimalist I blame the baby! My nesting instinct during pregnancy was to get rid of stuff. Lots of stuff! During my third trimester I embarked on 40 bags in 40 days. I was inspired by a fellow aspiring minimalist who I’m fortunate enough to now call my friend. I lasted all of 9 days! In those 9 days I managed to create 15 “bags” albeit some of them virtual. If you asked me now what I removed….erm out of date medicine and my emails. My emails took 15 hours (2 bags) and the medicine cabinet 30 minutes (1 bag). Other than that I’d have to check out my list of places that I had identified before I started. I know some areas I’d identified still haven’t been done (the shed!) and others have been gone through numerous times, although not in that initial flurry of activity. It took a further 9 months before I began my consistent, step by step journey towards a more mindfully minimal lifestyle. In November 2014 I started to remove stuff/things/items/possessions. Call it what you will, it was clutter and it was getting in the way. I actually restarted because I wanted to acquire something. A wooden 12 piece rainbow for my daughter’s first birthday. If 12 pieces were coming in I wanted to have sold sufficient ‘stuff’ to fund it. I didn’t actually need the money but it was useful having a target. I did it in 2.5 weeks. Since then I’ve used money from selling to fund two dress making classes and to buy another laptop. I can’t say replace as the previous four are still in the house but it is a replacement. I’m now saving to do a Masters degree. I’ve tried numerous techniques along the way. Some have stayed, some have been discarded along with more clutter. These however are my top tips to get started. This may seem obvious, but just start. You don’t have to wait for the perfect time, or until you have the perfect strategy. Just start. Put the pile of read (or unread magazines in the recycling). Pick up 5 things that are in the wrong room and put them in the right room (preferably away but to be honest in the early days there may not be space). Start with the end in mind and set yourself up for success. Most people know where their bin is and hopefully their recycling too. If you don’t I suggest you acquaint yourself with them as a first step as they are essential parts of a minimalist journey. It is much easier if you know where you are going to put the items you remove. I use the four ‘box’ method – trash/recycle, donate, sell, relocate. They are not so much boxes as bags and a basket for the items for relocation. I prefer to have them all with me and then move them at the end of a period of decluttering (or when they’re full) to the end point (i.e. the bin outside/charity shop/put the relocated items away). When paying off debt one school of thought is paying off the smallest debt first (while maintaining minimum payments on others) so you start to see small successes and can snowball them. I feel it is the same with minimalism. Rather than thinking I’m going to tackle the entire bathroom, focus on the medicine cabinet. Rather than the entire bedroom, do your sock drawer. Kitchen = pantry. It may sound crazy but I don’t think most people have a lot of emotional attachment to their out of date medicine or holey socks. Identifying these areas can give you quick wins as whether something needs to go is usually obvious. If you need any convincing on why it is important to get rid of out of date medicines then Anne Lene at Minimalist sometimes wrote a great piece on the very topic: Expired medication…It is important to remember to dispose of medicines safely at a pharmacy though. Having a targets has helped immensely. My original target was 40 bags in 40 days. At the rate I was going, if I had maintained momentum I would have done 40 bags in 24 days. What I learnt was having realistic goals helped build momentum as I had a sense of achievement. The two most depressing days were the email clearing and eventually I counted it as 2 bags. It felt never ending yet on a different day, Medicine Cabinet – done. I may as well do the under the sink cupboard and pantry too. Three bags in one day! Once I had embraced the idea of getting rid of stuff, early on I found it much easier to do quick sweep round a room pulling out anything that I new immediately needed to go. This is great if you are wanting to do a lot quickly, however in depth decluttering will hone your skills. Maire Kondo recommends a specific order with which to proceed as the difficulty increases. It leaves sentimental items until last and having recently been through the memory boxes in the attic, I was glad I had honed my skills as three rocks in a box and a bit of wood gnawed by a beaver could just go! If you are at the start of a minimalist journey, the target of bin day or trash/recycling collections can be a real motivator as deowning is as important as the initial decluttering. Fill an extra bag with rubbish or recycling and get rid. 5. Take the Goldilocks challenge. Never heard of the Goldilocks challenge? It’s making sure that you are taking the just right challenge. Rather than biting something off that is too big to chew like the entire kitchen, break it down to a challenge that is just right. You could break it down by location or type of item. Personally I’ve tended to break it down by location: the fridge; the freezer; counter tops; top cupboards; bottom cupboards. When you’re starting perhaps only doing one cupboard at a time, especially when you are time poor. As we are all so used to feeding our fantasy future self, it is equally important to not act into her when we are removing things too. She may want to live in an amazingly minimalist house, but you have to live in this reality. Even if you are on the journey it, much like a river, will ebb and flow. For helping remind me of this I love Elsie Joy’s poster Big Things Happen One Day at a Time. It helps me to remember that even if I don’t manage to do something everyday it is the overall progress that is important. Commit to working on having a more mindfully minimal life and every day you take a stem towards it, cross a day off. I’ve already written on The importance of community on a minimalist journey. Whether virtual or real, set up your support systems (even if they don’t realise that is what they are). It helps to have people in real life who you connect with over minimalism, whether a partner, friend or community who just get it. They understand why shopping is not, in your world, a leisure pursuit without feeling judged. As I said, my inspiration came from a very good friend who is also an aspiring minimalist, and since then many in my local parenting community have embraced to a greater or lesser extent the idea of decluttering. Even when decluttering is taking a back seat in my life I enjoy seeing how much others are doing online but I must admit it is the face to face conversations I find most powerful. The evolution of ideas that come from dialogue rather than monologue. While on maternity leave I spent many a Friday lunchtime discussing minimalism and I now no longer get the chance to do that which saddens me. Having said that, in the early days, in the middle of the night I gained inspiration and enthusiasm from reading blog posts. Online communities can be as powerful, sharing ideas across the globe. Many blogs are US based and it was with these I started, particularly Becoming Minimalist. However there is a growing online community in the UK and a list of UK Minimalist blogs can be found here. Ultimately, if you want to become a minimalist (or even just a little more minimalist), start today. Tomorrow is now!